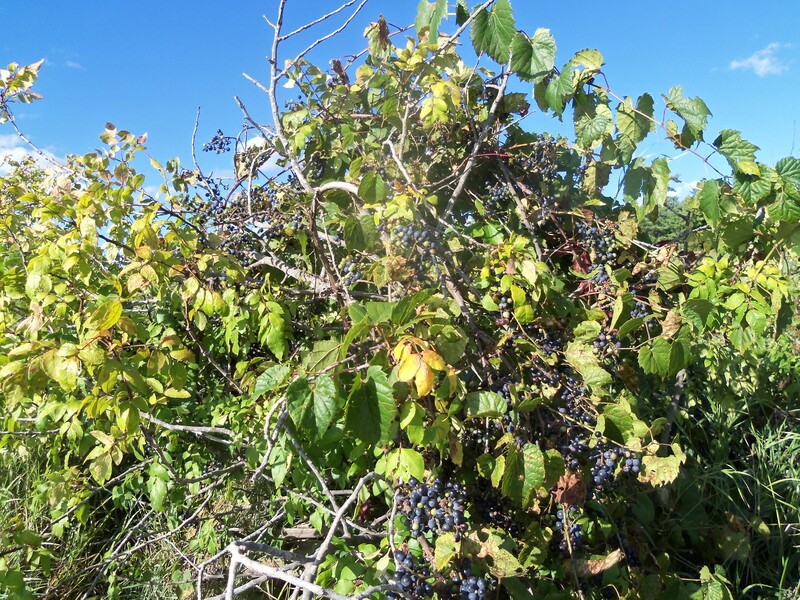 The wild grapes are finally beginning to ripen in our area, so I am now able to work on some recipes which were the ‘raisin’ d’etre for this blog. The birds have already taken many, so I picked what I could should they disappear soon. I am not sure of the exact variety of the ones I picked. These ones, as you can see are very small, about the size of a blueberry. I hope to find some larger ones for other recipes, but these small ones are excellent for this one. 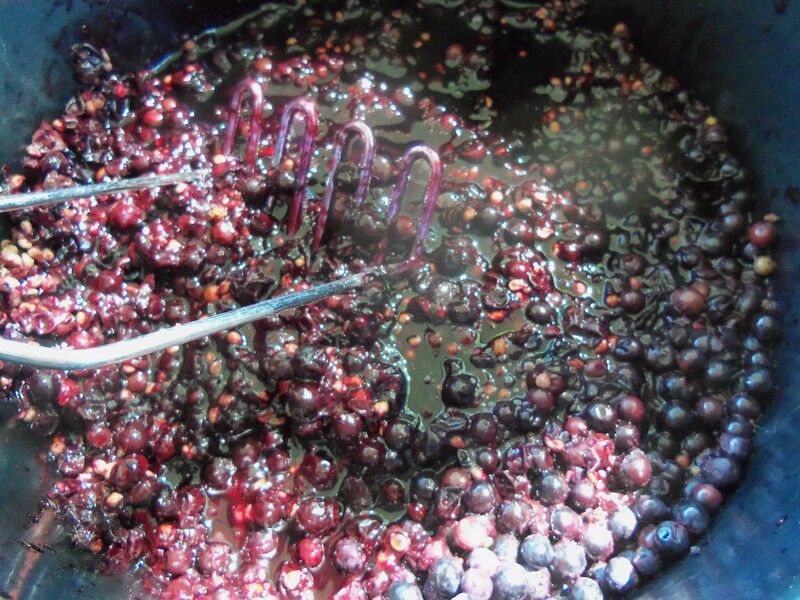 I started making grape ketchup a few years ago, as finding myself with a good supply of wild grapes, and not wanting to make either wine or jelly, I decided if there was not such a thing as grape ketchup, there should be. Sure enough, I was not the first to think of it, and there are plenty of recipes out there. However, most use cultivated grapes, which are larger and sweeter, but do not have the strong flavour or the nutrients of the wild variety. Also, I do not add water, which reduces the cooking time – good for me and the quality of the end product. Most any grape would work with this recipe, but I would recommend a fairly sour variety with a thick skin, which will add enough pectin to the mixture for it to thicken nicely. It is good not only as a condiment but as a marinade for game and poultry, and I expect would go very well with lamb and pork too. Apart from the picking, the ketchup is really very simple. 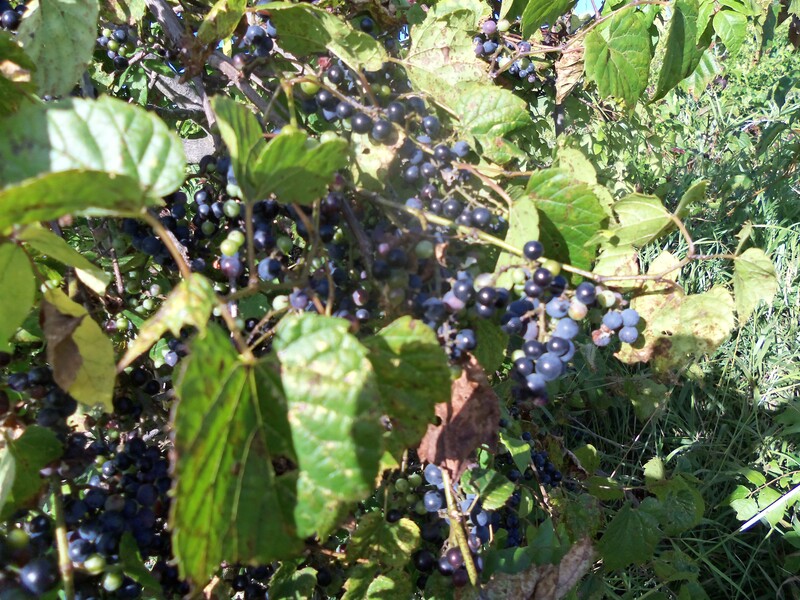 Just wash the grapes and pick the berries off the stems, discarding any green ones. Place them in a pan, heat and simmer for about five minutes. Juice will begin to form at the bottom of the pan, but to help them along, use a potato masher to get as much juice out as possible. Then, strain the mixture through a food mill or sieve, measure, and return the juice to the pan. Simmer the mixture until it is the right consistency, a little over an hour. I test it by cooling a small spoonful. I make it less dense than a commercial ketchup, but about as thick as a creamy yogourt. I do not process the jars – just freeze them. This is a fairly tart ketchup as I prefer it, but it could stand probably up to double the amount of sugar. You can easily add more as it cooks and taste it. I left a small amount in the bottom of a pan, and as a first use i deglazed it, added venison meatballs I had in the freezer and some quartered fresh plums. From that I deem the ketchup recipe a success. One experiment often leads to another. Left with a pile of grape seeds, which are supposed to be highly nutritious and, I have noticed, are sold in granular form in health food stores, I decided to dry them and see what I could do. I rinsed and drained them, removing some of the skin that rose to the top, but certainly did not get it all. I then put the dripping seeds in the oven at 275 for about an hour, and as they were getting too hot and the water had mostly evaporated, I spread them out in the sun for another couple of hours. I don’t leave anything in the sun too long, for fear of botulism, but by that time they were sufficiently dry. I ground them in the coffee grinder – and then on to my next experiment. I mixed a large spoonful in some hot water. It was a creamy pinkish colour but the seeds at the bottom were not very appetizing. Next experiment was to simmer the same amount in a small pot of hot water for about an hour and strain. The colour was browner, but the taste was equally good and no junk at the bottom. All in all, a pleasant surprise as experiments go, and for anyone who wants to get all the goodness out of the grapes, might be worth trying. Categories: condiment, recipes, wild fruit | Tags: condiment, foraging, grape ketchup, grapes, recipe, seeds, vegan recipe, wild fruit | Permalink. I was recently nominated by The Novice Gardener <thenovicegardener.wordpress.com> for the Liebster award, which is as I understand it, a blogger generated system to show their appreciation for other blogs and encourage their creators. I have only been writing my blog for a couple of months, and am yet to become proficient in the use of it, but am very flattered and pleased to have received a nomination – especially from a blogger whose posts I thoroughly enjoy, look forward to and recommend to others. 1. Thank the person that nominated you and link back up to their blog. I do not yet follow 10 other bloggers of this size yet, so I will regretfully pass. However, in the spirit of the activity, I will answer the ten questions she put to me, to the best of my ability. Here goes. 1. Tell me something about yourself that is not obvious from your blog. In two months time, I will have been living in this house for four years. This will be the first time in my life I have ever passed the four-year mark in one residence. It is weird and I have itchy feet. I love big cities and live in the country. 3. Which do you consider is your best post, the one you’re most proud of, the one you worked the hardest on, and you think it deserves more attention than it got. I will read it and tell you what I think. Wish I could feel that good about one. The best one is always the one I am working on in my head – it always has wonderful pictures, witty comments and substantial content. Maybe one day I will manage to transfer the blog in my head to my page. 4. Can’t pick just one? Pick 2 more. 5. A relative once said to my mother that I had a wild streak in me because I peppered my wall with Gauguin, unnecessarily worrying her. Can you all agree with me that he was crazy? Definitely. i once had my walls peppered with posters of Petula Clark (I just came across some and had to do something with them )- now that is crazy. Afraid not, really. At least none I can think of now. 7. Tell me, who is more inspiring? Mahatma Gandhi, Martin Luther King Jr., or Mother Theresa, and why? Not a big fan of any of these, but MG perhaps had the greatest understanding of the world and how it worked. Usually coffee, but it really depends on the setting and climate (tea in hot countries works best and goes with spicy food). Again, it is pretty much a weather-related thing – white in cool weather and red with meals and cold weather. Today is neither, so having vodka and cider which is good too. 10. Five Guys, In-n-Out, or Shake Shack? If neither, name your favorite burger joint. The only one I am familiar with is Five Guys, which I visited only recently. Don’t really like fast food or burgers much, which is probably why I write a blog on eating the slowest food of all – weeds. 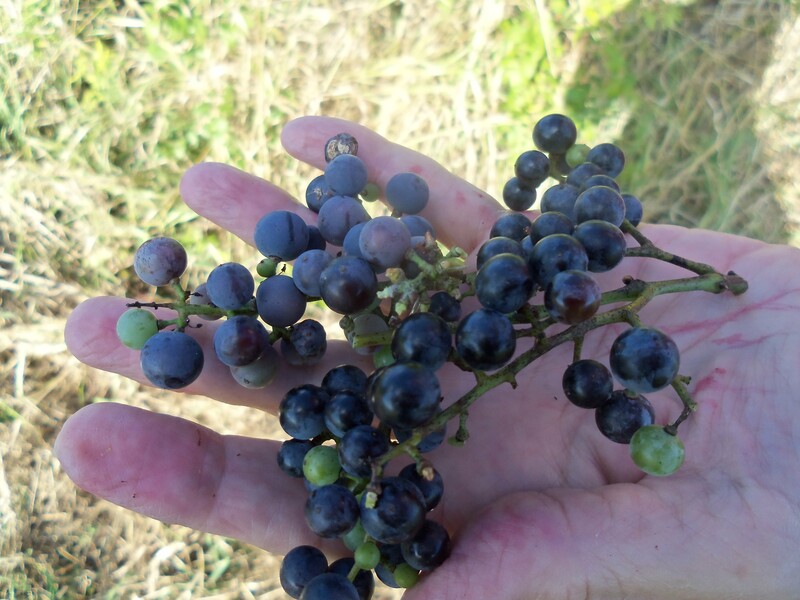 Have you ever tried seeding wild grapes? Purslane (portulaca oleracea) is yet another weed I have growing wildly in my garden, but only now have I decided to stop thinking of it as a pesky weed. I am even considering collecting some seeds in the fall, and growing some in its own little garden – away from my onions and leeks which it likes to snuggle up to. 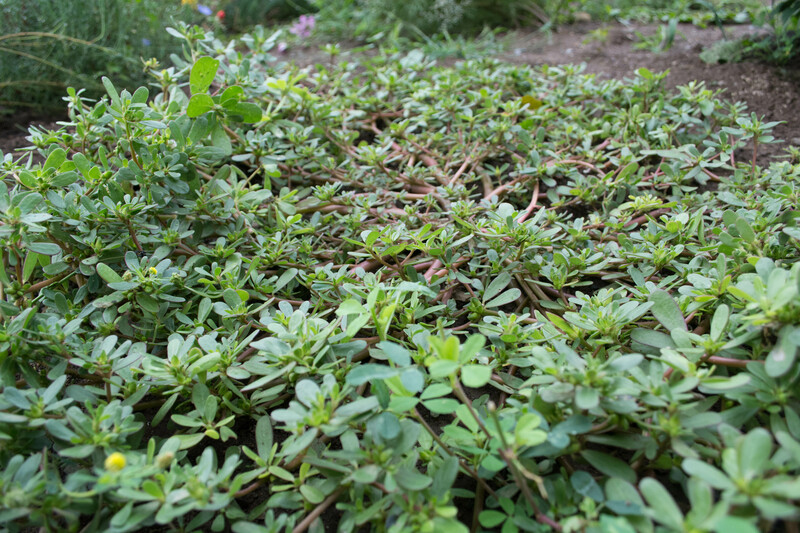 Nutritionally, purslane is a powerhouse. It has more than double the omega-3s that kale has and, as far as I know, more than any other leafy green ever analyzed. It has over four times the vitamin E of turnip leaves, more than any other leafy green ever analyzed. It has glutathione and other antioxidants and about as much iron as spinach. It also has reasonable amounts of other nutrients as well as phytochemicals, like all these leafy greens. 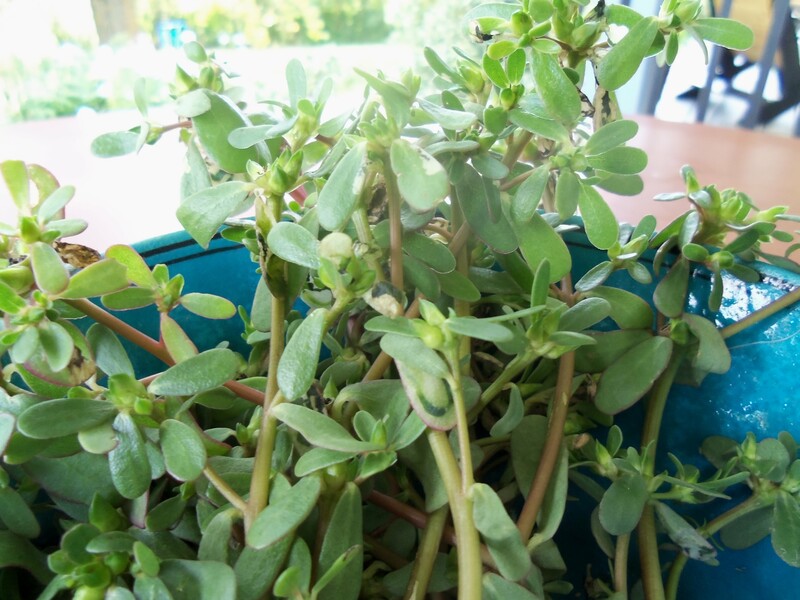 So purslane is no slouch, not a poison, and definitely worth eating. Many people studying the Mediterranean diet think that it is foods like purslane and other omega-3 greens that give the Greeks their good balance of fats. Olive oil only contributes some of the omega-3s; the greens, walnuts, oily fish, and a few other foods give them the rest of what they need. 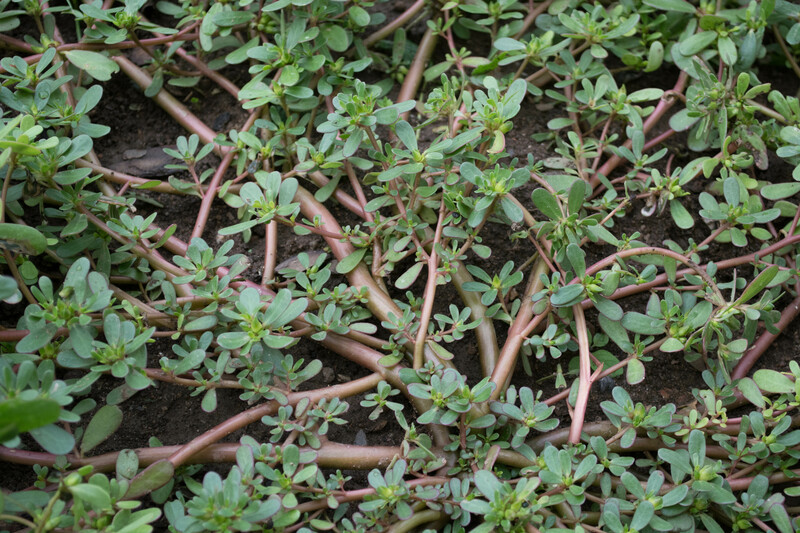 To help you identify it, it is a spreading plant, looks much like portulaca, and has reddish-green or purple tinted stems that are very fleshy. It has small, inconspicuous yellow flowers. If you pick only the succulent stem tips, the plant will continue to grow. Remove flowers as they appear, unless you wish to collect seeds. The flavour is lemony-sweet, and they are crunchy when fresh. As my first experiment in eating it, I decided to try it in its raw form to see how I liked the taste. 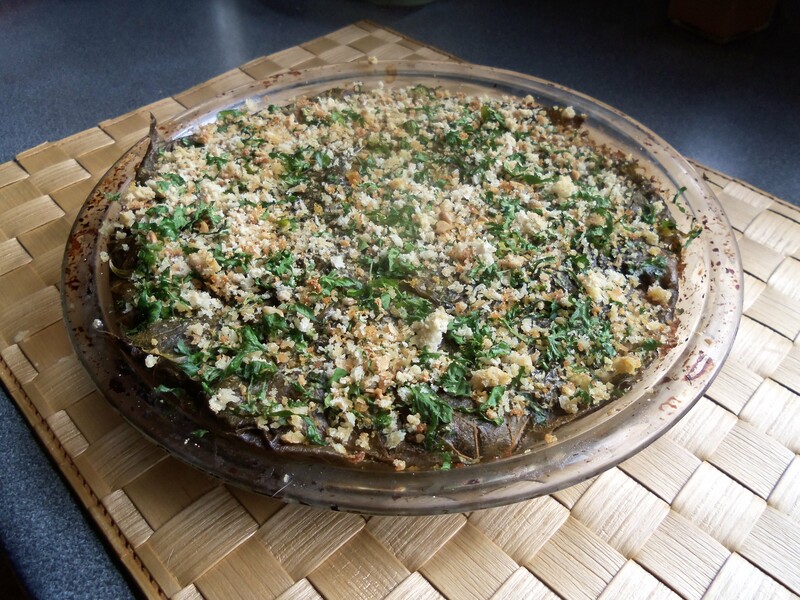 This salad is not really a recipe – just an idea for using fresh purslane. I used cabbage, shredded carrot, purslane, olive oil, salt and cider vinegar to keep it as simple as possible. Other herbs, shredded beets, jerusalem artichokes, or even a base of lettuce or some other greens would work just as well. Categories: edible weeds, recipes, salad | Tags: foraging, green salad, omega-3, purslane, recipe, salad, vegan, vegan recipe, weeds | Permalink. 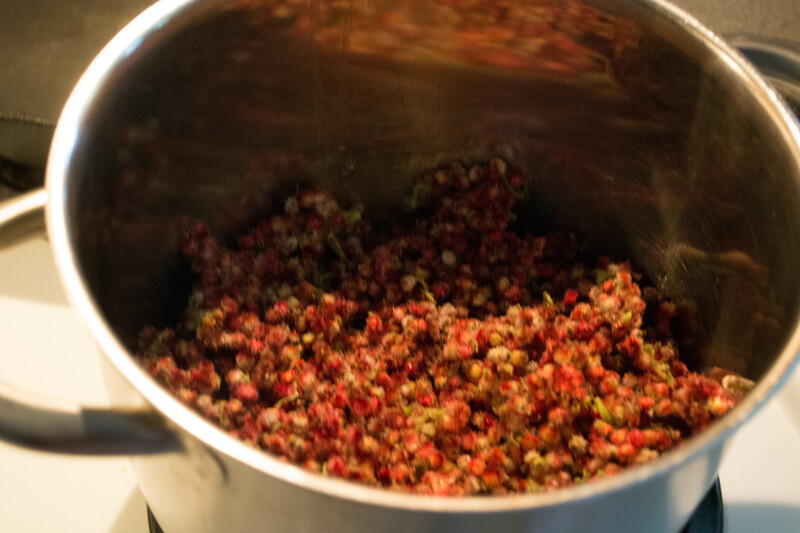 I have been using sumac powder as a spice for a long time, but am only now convinced that I can make the same thing with the sumac which grows all around us – except for the few hundred a year I pull out. It has a tart lemony flavour which is good in any spicy cooking, and can be used in place of lemon or lemongrass. My experiment with that will have to wait, but meanwhile, here is a recipe for a concoction which can be drunk as a hot tea, a soft or hard cold drink, or an added ingredient to your own drinks. The flowers can be picked now, while bright red, or later after they have turned brown. The only difference is in the colour of the final product. In some areas, the sumac is known as the lemonade tree, which gives you an idea of what the flower is like, and I hope to find more uses for it with a little trial and possibly error. 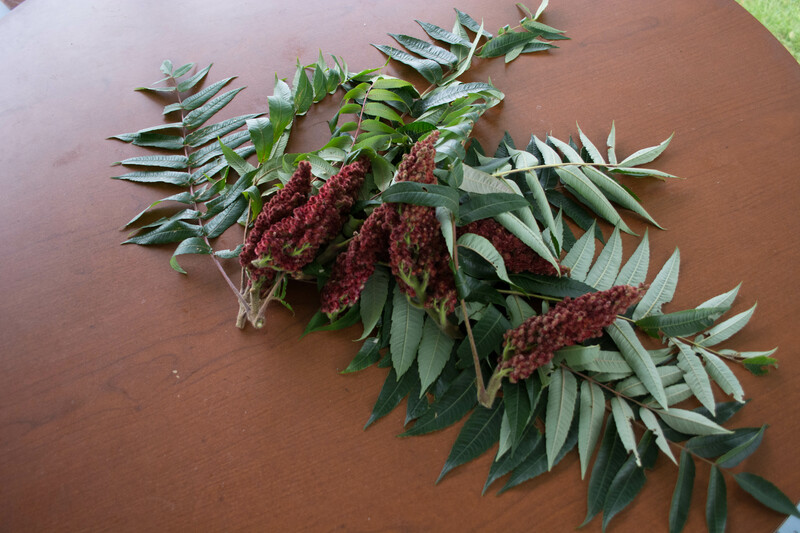 Pick some flowers from the sumac trees and rinse them. Scrape the flowers off the cone. I (I am not sure if this step is necessary, but it does make sense. If anyone thinks or knows otherwise, let me know). Mix 2 cups flowers, 2 cups water and 1 cup sugar in a sauce pan. Bring to a boil and simmer for about 15 minutes. 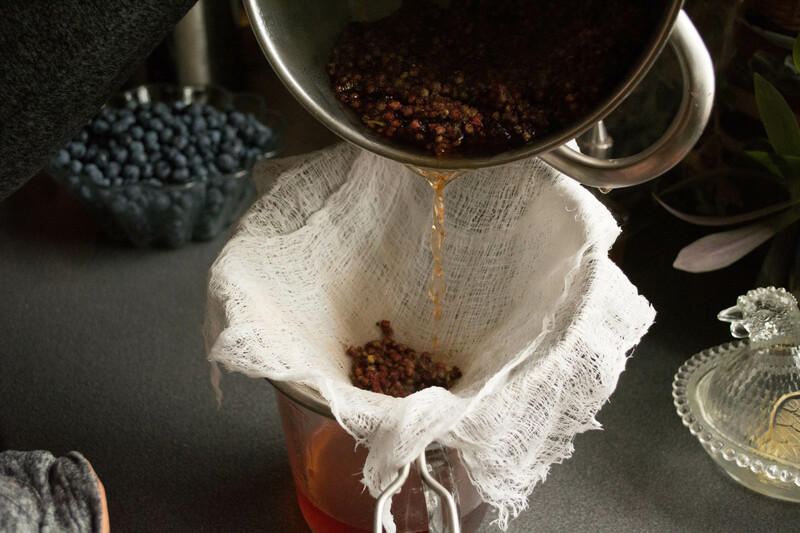 Strain through wet cheesecloth in a sieve (or some other material), squeezing out all the liquid. Discard the flowers. I used about 1 part tea to 4 parts soda water for a cold drink, but this is a versatile drink, so do as you like. It was also good with a little vodka thrown in. 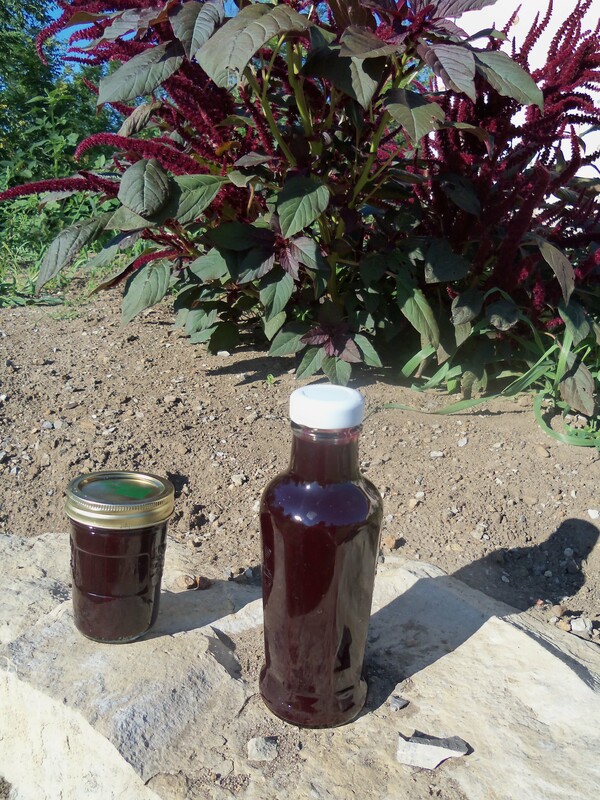 Categories: drinks, edible weeds, recipes | Tags: drink, edible flowers, foraging, lemonade, locavore, recipe, sumac, tea | Permalink.